I’m going to write about my new laptop. My old laptop doesn’t have a high performance so I’d thought I wanted to buy a new one. As I had the idea, I decided to go to The University of Tokyo, Todai from this April and I began to feel worried to go to Tokyo with my low-spec laptop. So I made up my mind to buy a new one. When I made a poster for an academic conference, my old laptop was crashed. I couldn’t work at all! Why I chose the VAIO laptop. VAIO Corporation is a manufacturer company in Japan. A VAIO laptop was used for my class. 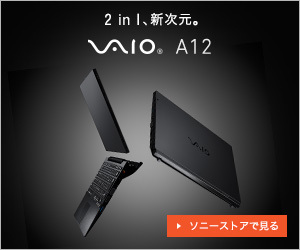 About VAIO A12 ALL BLACK EDITION. There is a VAIO website in English. But the laptop hasn’t been sold on the site yet. Until then, I often used a PC made by a foreign company, such as Acer, Dell, Lenovo, and so on. I’d bought a second-handed laptop made by a Japanese company to take it to pieces for fun. My major is biology. It’s a pun. It’s difficult for most Japanese, including me to distinguish v sound from b sound. I think VAIO A12 is a small and light laptop. I’ll have a greater opportunity to go to an academic conference. And I want to apply for graduate schools abroad so I’ll go abroad. (Actually, I’ve never been abroad...) So convenient for carrying is important in choosing. 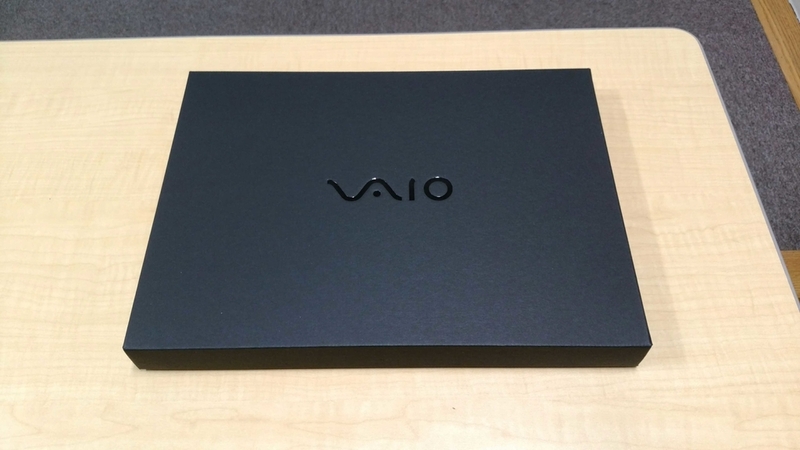 Like its name, the color of VAIO A12 ALL BLACK EDITION is black. It’s cool. For the first time, I didn’t know the meaning of 2 in 1 used for a laptop. 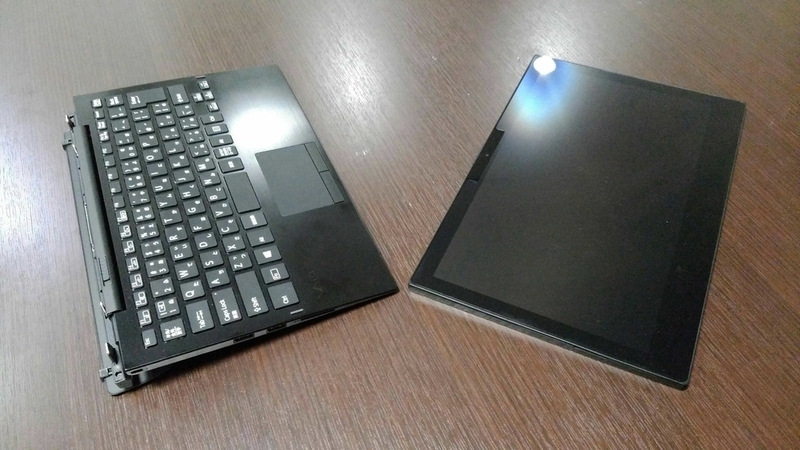 In short, 2 in 1 laptop can be used not only as a laptop but also as a tablet. I began to think that I wanted to try e-books. This is also because I’ll go to Tokyo to live in. When I move from Osaka to Tokyo, I need to ask to carry my books to Tokyo. I have a lot of books. In addition to heavy books about biology which is my major, I have books about programming and physics. If they were e-books, it would be easy for me to prepare for moving. Some people have a tablet for e-books in addition to a laptop. But I don’t have much money and I don’t want to carry both laptop and tablet to go around. So I decided to buy 2 in 1 laptop. It is said that 2 in 1 laptop is unstable and heavy to use on a lap. 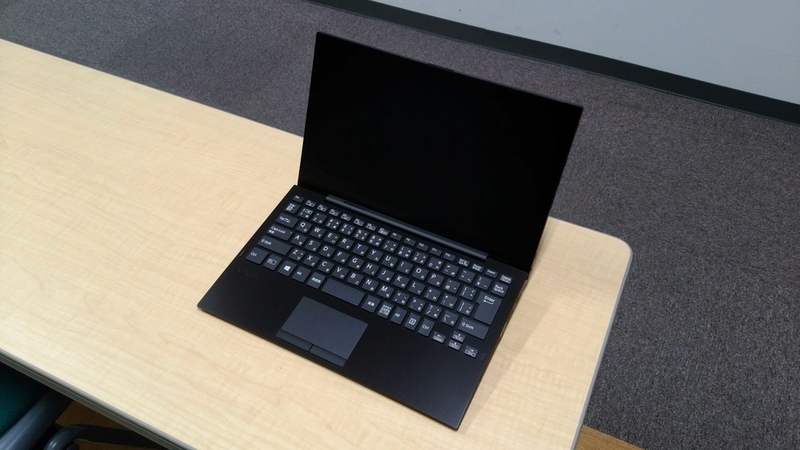 But VAIO A12 overcomes the problem with “stabilizer flap”. Roughly speaking, conventional 2 in 1 laptop isn’t easy to use on a lap. On the other hand, VAIO A12 in 1 laptop is easy to use on a lap. CPU is like the brain of a computer. In the past, the major indicator of CPU performance was clock rate. (the number of CPU operations per second) But the clock rate hasn’t increased recently. Instead of clock rate, I think the numbers of cores (the number of brains in CPU) and threads (the number of jobs CPU can do at the same time), and electricity consumption are indicators of CPU performance. Intel Core series (i9, i7, i5, i3) is the most well-known CPU. There are variety types Core i7. CPU equipped with the laptop is the 8th generation, Core™ i7-8500Y. It usually saves electricity but sometimes works very hard, according to specifications. I think some confuse memory with HDD. Memory is not a data storage but a workplace for PC. Data storage is HDD or SSD. Ideally, it’s enough for a computer to have only CPU(brain) and HDD (data storage) But sadly, it doesn’t work. As I mentioned, the clock rate (the number of CPU operations per second) doesn’t increase but it’s much faster than HDD. A disk in HDD is turning and a magnetic head read data on the disk. The process is slow compared with CPU. When CPU is connected with HDD directly, as CPU finishes its jobs more quickly than HDD, CPU spends most time waiting for HDD finishing. To avoid this situation, a memory which works more quickly than HDD, pass on data from HDD to CPU and vice versa. HDD is slow but can maintain data permanently. On the other hand, memory is fast but maintain data temporarily. They cover the shortcomings of each other and they try to offer jobs to CPU continuously. But still, CPU is faster than memory so there is cache memory in CPU. You can choose between 8 GB and 16 GB of memories. And I chose 16 GB. Monitoring the usage of memory using Task Manager, I sometimes use more than 8 GB of memory. So I think 16 GB is appropriate. When I was a high school student and study about computer by myself, when it came to data storage, I could image HDD but recently, SSD has become popular. About one month has been passed since I started to use this laptop and I noticed one drawback. Maybe it’s obvious because it’s ALL BLACK EDITION, that we can easily see dirt on the laptop. Its keyboard except for keys, is made of metal so that it easily gets dirty. In addition, when you use the laptop as a tablet, its back gets dirty. If the problem is solved, the laptop will get better. It costs me more than 350 thousand yen. Maybe this is the biggest purchase I’ve ever done. I’ll acquire knowledge and skills about programming which are worth the cost and I’ll do something with it which is worth the cost.